I've never been a huge fan of pesto. I was never sure why. Something about the flavor just kinda rubbed me the wrong way. And I've often been told by readers that I'm not allowed to review foods that I don't already appreciate because my score will be unfairly biased against the product. But this product is a prime example of why I still try foods that I "know" I don't like. In this case, like so many others, the devil was in the details. I never bothered looking at the ingredients of traditional pesto. Usually, there are pine nuts. And I hate pine nuts. To be fair, if Trader Joe's ever offers a bag of plain pine nuts, I'll refrain from reviewing those—unless it's some new species of pine nuts or ones coated in wasabi or cookie butter or something crazy like that. Cue the reader comments that tell me TJ's does offer a bag of plain pine nuts. And a version where they're covered in wasabi. Wouldn't surprise me. Readers, we love your comments. But anyway, I digress. The point is that this product employs cashews instead of pine nuts. And I like cashews. And that makes all the difference in the world to me. I mean, the product doesn't taste a lot like cashews per se—I just prefer them as an ingredient to pine nuts. 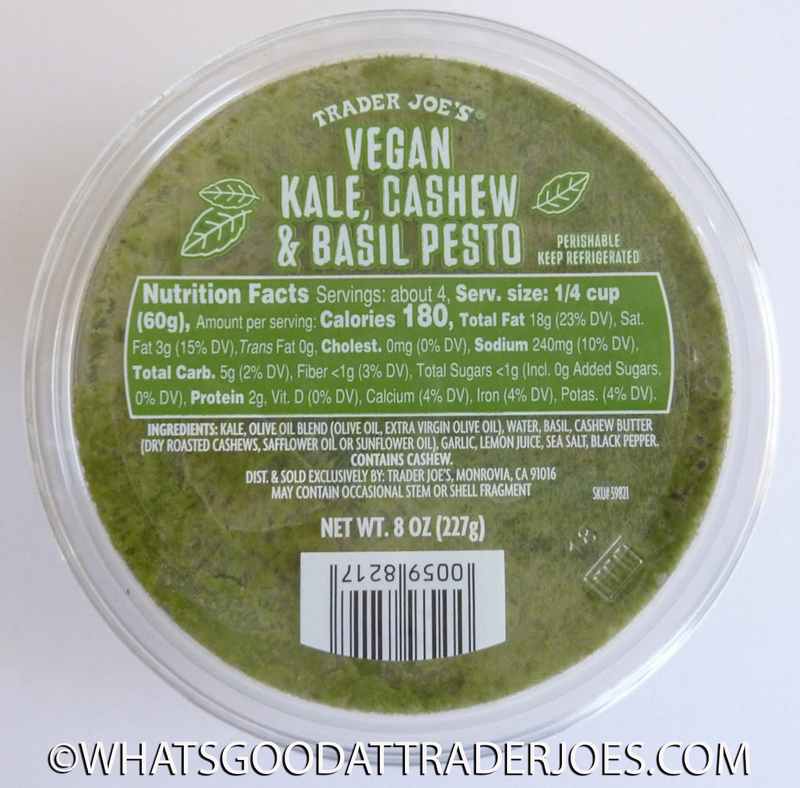 Also, I'm not sure that most pesto contains kale...and I like kale, too. The texture is like a mushy vegetable puree. It's thick, soft, and spreadable. I'd eat this stuff on pasta, potatoes, sandwiches, crackers, pita, or even as a chip dip. Sonia liked it enough that it inspired another short video review. $3.69 for the tub. Four stars a piece. You might like regular, non-kale pesto too. Most of the ones I see in the stores don't have pine nuts. Pine nuts are very expensive. They substitute almonds or walnuts. Can't recall how TJ does it, but I've tried theirs and Aldi and prefer Aldi. FYI. YMMV. I found it had too many pieces of veiny, tough kale stock for me to enjoy. And it’s vegan! No parmesan like traditional pesto. 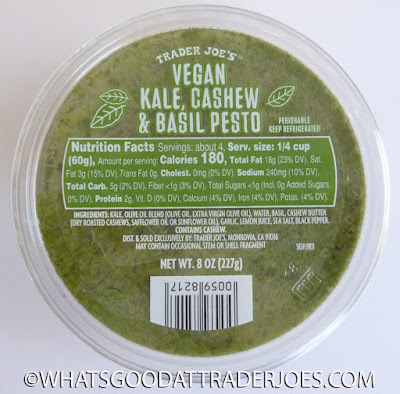 There is no way I would have tried this before your review - I actually like TJ's regular pesto just fine. Usually I'll mix the regular pesto plus the TJ's refrigerated bruschetta sauce to have with pasta. But now this vegan one with cashews sounds even better. I'll pick it up on my next trip. Thanks! I don’t remember a time when Trader Joe’s didn’t sell bags of plain pine nuts. They have both raw (https://www.traderjoes.com/fearless-flyer/article/3615) and dry-toasted. No wasabi, alas.